The slideshow above gives a glimpse of what our design meeting will be like. When we propose and illustrate a solution to our clients, we show them a true-to-life rendering and show it from the various important angles so the homeowners know exactly what they will be getting. These Gaithersburg homeowners came to us with a full walkout basement on their 18-20 year old existing home and asked that we create a screened porch and deck combination that they can enjoy everyday. They wanted the type that would transport them back to a time when the days moved a little slower and the pressures of the everyday were non-existent. They wanted the design to provide functionality and style. We were able to give these homeowners both with a rustic screen porch that is reminiscent of the screened porches we enjoyed when we were all children. The kind of structure that takes you back to a time of fewer worries, more fun and a lot more time to relax. 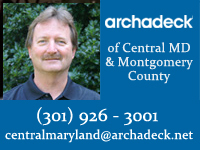 This angle of the custom design rendering shows how Archadeck of Central Maryland and Archadeck of Montgomery County solved the roof height concern. When we first began construction on this Gaithersburg screened porch, we were concerned because the roof lines were a challenge with the garage roof being one story and the existing home being a two-story roof. Wherein lies the challenge that half the roof was over the garage and half was over the home. We love the challenge in overcoming even the most difficult challenges to find a design solution. We utilize design software to help us illustrate these challenges once we create a design solution to fit the homeowners’ needs and design challenges. We were able to present these Gaithersburg homeowners with a professional design rendering that encompassed everything they wanted and more. This is perhaps the most fun part of the job – being able to come up with creative solutions. 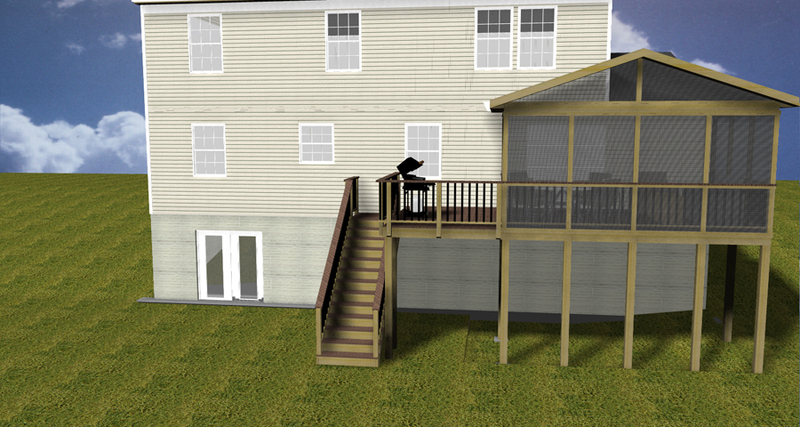 The new location of the stairs adds more accessibility into the backyard. 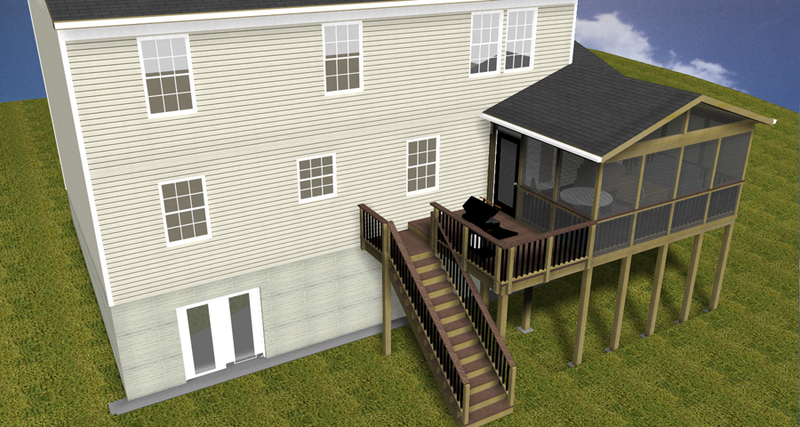 Our solution was to re-structure the homeowners’ existing deck to support the weight of the screened porch. 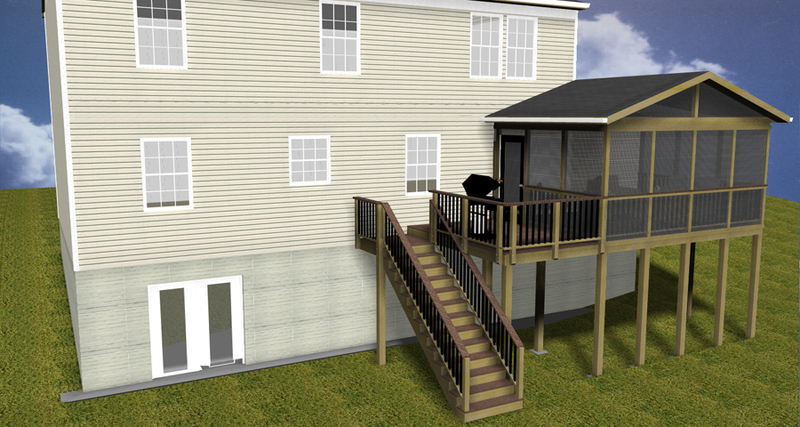 We then enlarged the deck to provide a barbecue area adjacent to the screened porch.We usually find that when homeowners add a screened porch to their deck area they don’t need as much of an open outdoor area as they would if they did not have the advantages of a screened porch. 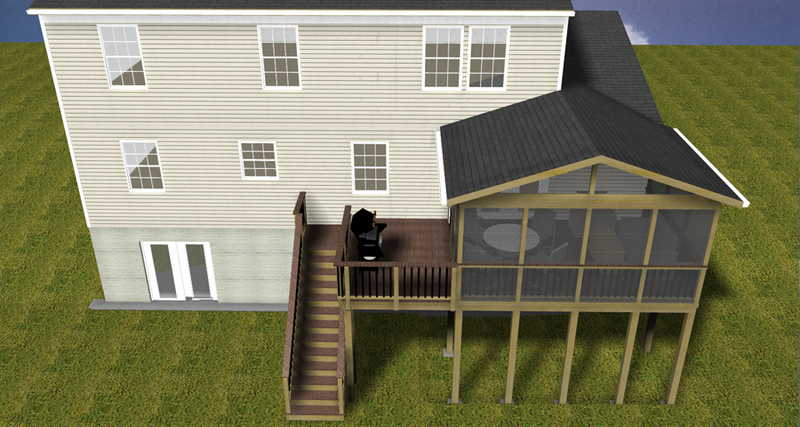 Homeowners end up utilizing their deck space for a barbecue or grilling area and additional seating and dining. We then relocated the stairs to provide access to the backyard. The enlarged deck was then re-decked with TimberTech composite decking in beautiful twin plank in redwood. This color choice adds to the rustic charm of the entire structure. To complement the new deck, we used black Deckorators balusters. 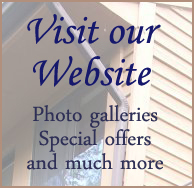 The screened porch is designed with an open screened gable to provide ample light and ventilation. This open and airy design element is further carried out with the use of open, exposed rafters. The combination of the exposed rafters and the open design of this screened porch gives it a country casual, rustic feel that is really popular among screen porch owners right now. Rustic never goes out of style, they are just more detailed versions of the beloved screen porches our parents had growing up.